We have been making claro slab tables, mostly with steel bases, since 2009. We have made over 30 of them so far, and there are 46 posts in the 'claro walnut slab tables' category on my blog, which you can access from the home page of this website. i have also recently added a slide show with images from those posts that you can access in the November 10, 2014 archive. i also wrote a blog post called 'what kind of steel base can i have on my slab top table?' 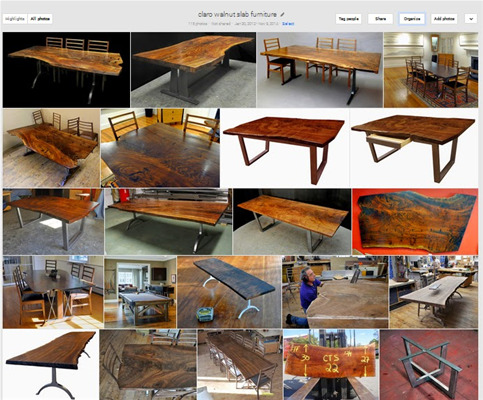 on March 9, 2013, and one entitled 'how much does a claro walnut slab table cost?' on March 3, 2013. There are a lot of choices when it comes to these tables and hopefully, those blog post can answer many of your most basic questions. It never hurts to send us an email or give us a call at 802-867-5541 if you have questions. we also have access to slabs in ash, oak, maple, bubinga and many others.